« A Great Cracker Recipe! First you pick the beets. 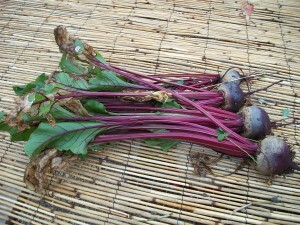 Medium sized beets work best. Then you either cut the tops off to stir fry or, if you have goats or chickens, they love them too! Once you’ve removed the tops and trimmed off the long tap root, simmer the beets until they are tender, which you can test by piercing them with a fork. Peel them, then cut them into 1/4 to 1/2 inch thick slices. I have a tool that gives them a pretty wavy edge. I got this tool at Fred Myers. Pack the slices into sterile jars and add in about a teaspoon of pickling spice. Make up a pickling solution of 3 1/2 cups vinegar to 1 1/2 cups water and 1 1/2 teaspoons of pickling salt. Be sure to use 5%, store bought vinegar as acidity levels can vary in homemade vinegar. It’s the acid in the solution that will keep your food safe. Toasting the spices first can bring out the flavors. Fill to within about a half inch of the top. Then seal up and boil in a water bath for 30 minutes. 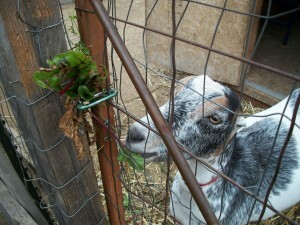 This will help to ensure that the beets are truly safe to eat. Let sit for at least two weeks for flavors to blend. 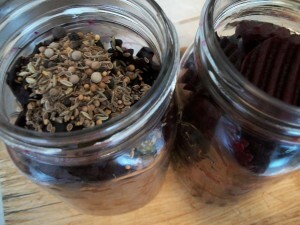 You can also custom-design your own pickling spice recipe. Much tastier than the kind sold in the store. Cardamom is fun to use. Or sassafras or sarsaparilla. So are hot peppers and ginger. Depends on your tastes. Carrot spikes liven things up shapewise (but carrots turn the same dark red as the beets or a dull pink). Some people like to add onions. Parsnips might be interesting to can. Maybe with ginger. 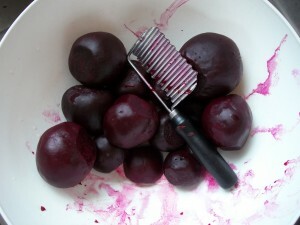 You can use the cooked beet juice for coloring eggs. Also, you can use a vinegar solution to can carrots or green beans. Yummy! — especially if the carrots and beans are still crunchy. Have you ever tried fermenting them. You don’t have to cook, just put in a jar and cover with a 5% sea salt solution. Keep them covered. I use a fermenting lid with airlock. They are great. What a great idea! 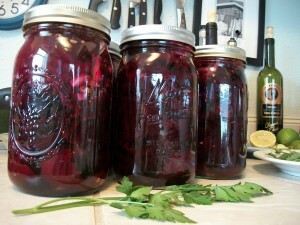 I love fermented foods but haven’t tried beets.